I biked home from work on Tuesday (Too bad it’s Bike To Work Week, Not Bike From Work Week!) and went down Shoal Creek from Anderson to 41st. Report at the end. The Chronicle has covered the recent brou-ha-ha, and kudos on the title. I have submitted a crackpot letter (check in a couple of days) which attempts to correct the misinterpretation of Lane’s excellent soundbite (the obstructions he refers to are the parked cars, not the curb extensions). 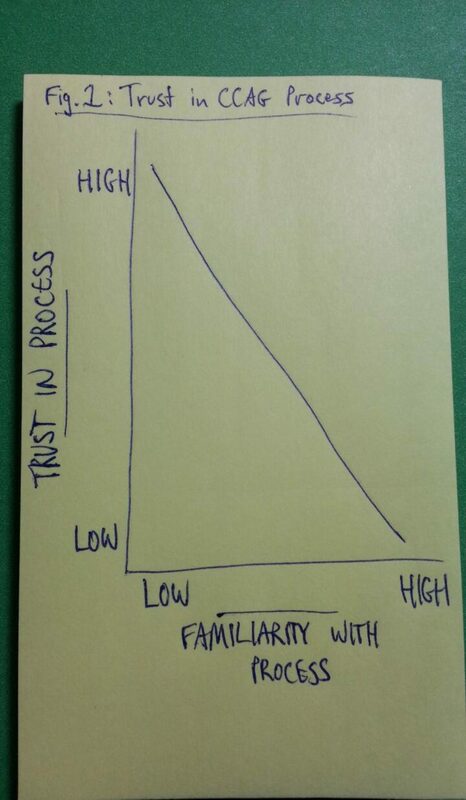 The ride home was pretty good, actually. About five passing manuevers were necessary, and on two of them I had a motorist stuck behind me; and neither one showed evidence that they were perturbed. Definitely above par for the new striping. I wish I could believe that the motorists are getting the message about the necessity to take the lane to get around parked cars, but the comments from the neighbors at that meeting lead me to believe that I was just lucky to get a couple of reasonable motorists this time. There was a public meeting on Wednesday night about the Shoal Creek Debacle in which many previously uninformed local residents complained about curb extensions and cyclists riding too close to the line (forced to do so, by the way, by the fact that there are CARS PARKED IN WHAT WAS SUPPOSED TO BE A BIKE LANE). > wanted a “veloway” through our neighborhood from 38th to Foster? Another way to put it is that Shoal Creek Boulevard is the most important route for bicycle commuting in the city. It forms the spine of the main route from points northwest (disproportionately recent residential growth) to the center-city and vice-versa; and serves as the bicyclist equivalent to at least Burnet Road, if not Mopac. Yes, a bunch of people also ride this road for fun. And I’m as frustrated as you are (probably more) when the brightly-plumaged folks out for a training ride treat stop signs as matador capes. But every day during rush hour you’ll also see dozens of cyclists clearly heading to or from work. This isn’t because they want to turn your neighborhood into a “veloway”; it’s because SCB is the recommended route for people who, in their cars, would be using Burnet or Mopac. And this is the way it’s SUPPOSED to work – you’re not supposed to turn your major arterials into cycling routes, you’re supposed to find a lower-traffic parallel road which can feasibly serve the same purpose. Without SCB functioning as a major “cyclist artery”, you’d be complaining about these same cyclists slowing you down on Burnet Road. The city’s legitimate interest in promoting bicycling as transportation requires that some routes like SCB be “major bicycling routes”, which implies that the interests of cyclists should AT A BARE MINIUM be considered above both-sides on-street parking. The city council failed miserably in this case in understanding that those two interests could not be served by a compromise solution; and the neighborhood has failed miserably in understanding that the parking-on-one-side solution already represented a signficant compromise for the bicycling interests, since it still required riding slightly in the “door zone” on the parking-allowed side of the street. And, by the way, “through our neighborhood” smacks of an ‘ownership’ of SCB which isn’t supported by the facts. Even when misclassified as a residential collector, it’s still “owned” by the city, and the street MUST serve the interests of people who don’t live on that street (or even in that neighborhood). Even if SCB was misclassified all the way down to “residential street”, no automatic right to park in front of your house is conveyed – I have to pay for a permit to park on my street; and some residential streets in my area have large sections where parking is only allowed on one side. Lomax’ comments about Austin not building any roads during the 1980s and 1990s are, in fact, a load of crap. That didn’t stop the media from playing them without even bothering to check up on the details, of course. Austin, in fact, built a ton of freeway miles in the 1980s and 1990s – they were overwhelmed by a growth in average miles driven per capita, which was the predictable result of opening up miles and miles of farmland to low-density suburban sprawl. 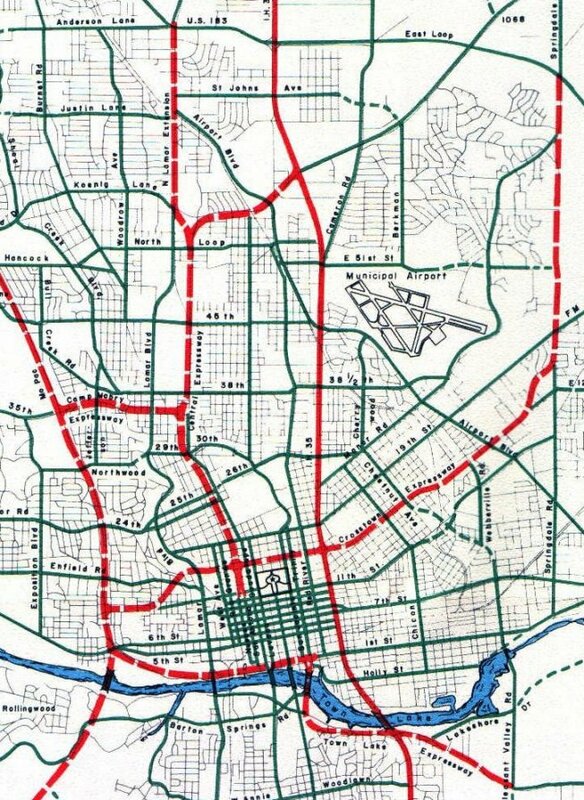 Although a few ill-advised city-destroying freeways were rejected by Austin in the 1960s and 1970s, it’s doubtful TXDOT would have had the money or the will to build any more than what eventually got built anyways. Most of the cancellations occurred long before the 1980s; Koenig Lane was the only one to survive even on plans in the modern era which isn’t now essentially built or getting built. The 183 corridor, from I-35 west to Spicewood Springs, was upgraded to freeway in the 1980s and 1990s. So was Ben White Boulevard (290/71) from Congress to past Mopac. Mopac was extended several times during this period as well. Full coverage at Jeb Boyt’s site, and I agree with Keath that the TTI’s motivation is to spin things to support big transportation projects like the Trans-Texas Corridor. 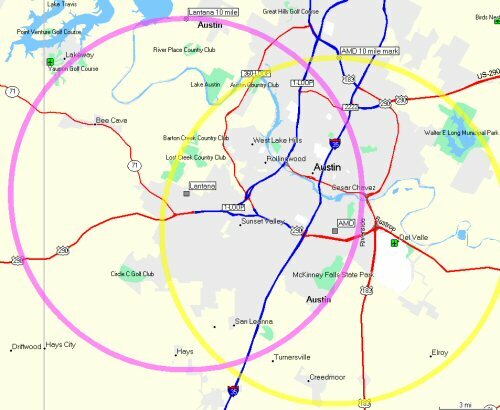 AMD’s been claiming that their upcoming move to environmentally-sensitive land in southwest Austin is a net-positive since ‘most of [their] employees live within 10 miles of the new location’. austinaction.org has shown how ridiculous this claim is (not untrue, but ridiculous as a supporting argument). Note that EITHER location captures almost all of the current residential development south of the river. 10 miles turns out to be so generous a claim as to be ridiculous – it’s like me saying that 100% of my stepson’s fifth-grade classmates read at at least a first-grade level. No, this move is about one thing and one thing only: getting AMD closer to the CEO’s house in the Barton Creek subdivision. Don’t be fooled; if AMD wanted to reduce employees’ commuting distances, they’d move DOWNTOWN. 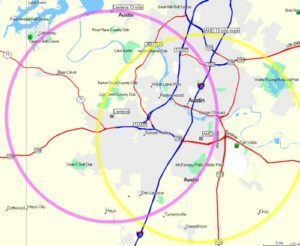 A 10-mile circle around downtown would capture nearly all of the existing residential development south of the river PLUS most of the east-side (neighborhoods around 290) and a healthy chunk of the north-side.